I got this recipe from my friend, Kathi. Every time I bite into one of these little nuggets, I'm surprised how delicious they are and . .. well, you can't stop at one, believe me! These are great for party trays with other little bites. Since this is not a sweet pastry, you can omit the raisins and fill them with a savory filling (once cooled) as well. This recipe yields about 3 dozen. Plump raisins by soaking them in boiling water for a few minutes, then strain. Combine first 4 ingredients in small saucepan and bring to boil. Add flour all at once, stirring over low heat beat with wooden spoon 1 min or till mixture leaves sides of pan and forms a smooth, thick dough. Remove from heat. Continue to beat 2 minutes to cool slightly. Add eggs, one at a time, beating each in well. The eggs will be slipping and sliding at first, but keep stirring, until they are mixed in well. Drop by teaspoon on greased and floured cookie sheet and bake at 375° F about 25 min - till golden. Spread with lemon frosting while warm. Melt butter and stir in cream. Remove from heat and stir in the rest of the ingredients. These really really look good. Love the lemon frosting. This recipe will be on my list to try soon. They sound yummy and look pretty too! 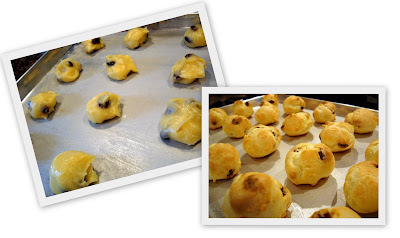 These puffs look wonderful, Anneliese..I would have never thought to put raisins in them! Perfect for a party at work this week...looks great, bet it tastes great...and minimal work too! Thanks. Boy Betty...you are getting quite the verification words...you are on a roll! I'm so happy I found your blog! Happy homemade food is the basis for a good home. I made your spaetzle recipe just yesterday, such a simple but perfect dish. Thank you so much! Our youngest daughter and I want to know how many MILES you ladies walk each day to avoid weighing 700 pounds from all these amazing recipes you share....I'm thinking I will make these for my dad when I go down when he has surgery in a couple of weeks...he loves cream puffs and raisins...I could make a few without the raisins for my mom and fill them with her favorite chocolate/banana filling. Thanks for sharing. I told some ladies at our local yarn shop about this site and they were all reaching for paper to write down the name of your site. Thanks for helping provide NEW recipes for my life! I've made some like this before and love them to death. I got the recipe from Taste of Home. I could eat each and every one of them myself. Now you've got me craving them! The recipes here are so yummy and of course the pictures help a lot.Thanks. I've made these before. ..but not for ages.. .and now I could really go for one with my afternoon coffee. These look so flaky good!! I will be trying this one soon!! Thanks for sharing! Another recipe that I must try. Sounds wonderful. Wish I had one right now, with a cup of coffee. I really want to try these. They look and sound delicious. What a delicous looking treat. That photo of the inside of the puff is excellent. This looks like an easy dessert that I could make here! I must try it! I tried these today. My beating muscles aren't what they used to be--lol! These were fun and easy! My family loves 'em! Thank you for all the wonderful recipes that you share. I made these today and had 4 of them before they even cooled down :) Delicious! I was wondering how long they keep and how to store them? They keep alright to the next day, uncovered. You can freeze them, but I wouldn't store them in a sealed container. Thaw uncovered. I find they are best fresh - like doughnuts. Hi Gals, nice that there's still some tradition being passed on...via your website. This one for "Raisin Puffs" was a new one for me this Christmas and everyone at our family party went crazy over these. I guess I hadn't made enough as there were a lot of people that didn't get a chance to try them...but were envious when they heard the "mmm's" the "ooo's" and the "aaah's". Thanks and be blessed...a keeper for sure.